Please, please would you bring me the Sky Caddie this year… pretty, pretty PLEASE? Look guys, I don't get any kickbacks from Sky Caddie to tout this product. Heck, I don't usually like golf gadgets at all, but I really love this freaking thing. It's the next best thing to having Tiger Woods' caddie, Stevie, on your bag (and trust me, you can't afford Stevie). For those of you who haven't seen one of these, it's basically a Palm Pilot with a GPS and thousands of courses loaded into it. Chances are it has your course, and if not, you can upload it. 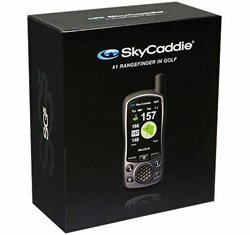 Sky Caddie is going to tell you exactly how many yards you have to the green while giving you an eagle-eye view of the hole, showing you the distances to the hazards or lay ups, etc. In addition, it instantly gives you the depth of the green from the line you're on. It will also tell you how far you just bombed it when you arrive at your ball in the fairway, and easily allow you to track how far you hit each iron. Finally, it will keep your score, and if you enter your index it will adjust for your handicap. And yes, it is perfectly legal by USGS rules (but not for PGA Tournaments). I'm going to be checking my stocking this year for this bad boy. I imagine a lot of us golfers will. Stevie better hope Tiger doesn't get one!